To be thoughtful about this “blogging” experience is to be critical I suppose. This hasn’t been my first experience at blogging, but to be fair it is more of an image blog (shameless self-promotion). But I’m not really sure if what we were doing could really be considered “blogging”, I feel it was more just a way to get us to write short essay type pieces without the burden of calling them essays. In saying that, it was interesting to investigate the different topics we had to cover. From that violent little girl smacking the bouncy doll (media effects), to the fall of Miley Cyrus (children and the media) and everything in between, it has been an unusual 6 weeks in BCM110. Prior to starting this subject I would have said I had a rather good understanding of the current media in general, but this experience of having to critically analyse different aspects has enriched my understanding even further. Another part of this project that I really enjoyed was exploring media ownership both in Australia and globally. I was well aware about the big players in the industry, but not so much about their reach or the extent in which they influence the media. By far and away the greatest part of this whole WordPress experience has been reading other students posts and gaining a better understanding into others thoughts on the media and life in general. There were certainly some very controversial comment threads on different posts, which coincidently relates to the topic for our 5th blog posts, the public sphere. All in all, I don’t think this was the best experience at actual blogging, but the insight and information gained on the industry was truly worthwhile. So here’s to the next 6 or so weeks! The ‘public sphere’ is a metaphor used to describe the way in which information, ideas and opinions are circulated within a society (p. 7, McKee). According the German sociologist Jürgen Habermas, who first explored the idea, the public sphere is a realm within social life in which public opinion can be formed and which is accessible to all (אני, 2011). Q&A is an Australian talk show, broadcasted on ABC1 and hosted by award-winning journalist Tony Jones. 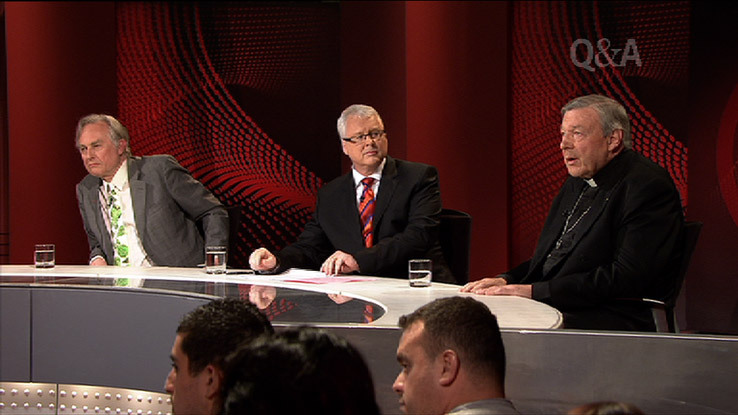 The program is a panel type format whereby five public figures; usually politicians, media personalities and celebrities, answer questions provided by a live studio audience (ABC TV Blog, 2010). What makes Q&A such a great example for the debate in the public sphere is that as the show is being broadcasted live across the Australian east coast, the audience can share their opinions on the topics at hand by using the hashtag ‘#qanda’ on twitter whereby the tweets, although moderated for profanity or offensive material, are shown on the screen for home audiences to view. As political or social issues are being discussed by the studio audience and panellists, the wider public also air their concerns and opinions about the topics. However the program hasn’t come without its own condemnations in the public sphere. Q&A has been long criticised by some News Crop Australia media outlets, in a widespread campaign against the ABC management for appearing to be bias to the left wing in both affiliations/ views expressed by panellists and questions asked by audience participants. I’m shocked, appalled even. What do you mean mass media is not an objective source of information? What do you mean history is written by the victor? It was interesting reading through a couple of the other BCM110 posts about this topic, it really makes you wonder about how many of these 18, 19 and 20 year olds really cared about their news sources before they had to research this question. Come on… really, how many of you seriously thought about who owned the corporations that bring you your favourite hard hitting articles, or gossip magazines? I know people who will buy a paper purely based on how pretty the front page looks (and most of the time that seems to be The Daily Telegraph). But people need to be media savvy with the amount of people vying for not only your dollar, but in many cases, your vote. As long as there has been media sources, there have been people trying to exploit them for their own gain. That’s just the nature of the beast, it’s a platform where people can build empires on the way in which information is interpreted by the public. I guess what it really comes down to is the fact that rich media executives didn’t become rich media executives by supporting views or schools of thought that didn’t help them become rich media executives. Another point many of these other blog posts were making is that Rupert Murdoch is an evil, evil man and it is his and only his political and social bias that oozes from the very pages of EVERY single media source that he has a stake in; which to some extent may be somewhat true, but it is not he who is editing or having the final say about what pieces are published. In a perfect world, media would be completely unbiased and it would be on the public to make its own decisions about how the information is interpreted. However, it has to be said that the public should be conscious of the bias presented by different media publications and outlets, and this should be taking into consideration when opinions are formed from this information. But this my friends is no perfect world. 9/11, no doubt an event that has been etched into your mind as the true embodiment of terrorism. But the way in which people view this disaster obviously changes around the globe. Ask an American how they feel and I’m sure they’ll talk about it with great sadness and respect for the victims, as well as a healthy dose of misplaced patriotism. To the Brazilian agency DDB Brasil however, the event obviously doesn’t command as much respect. 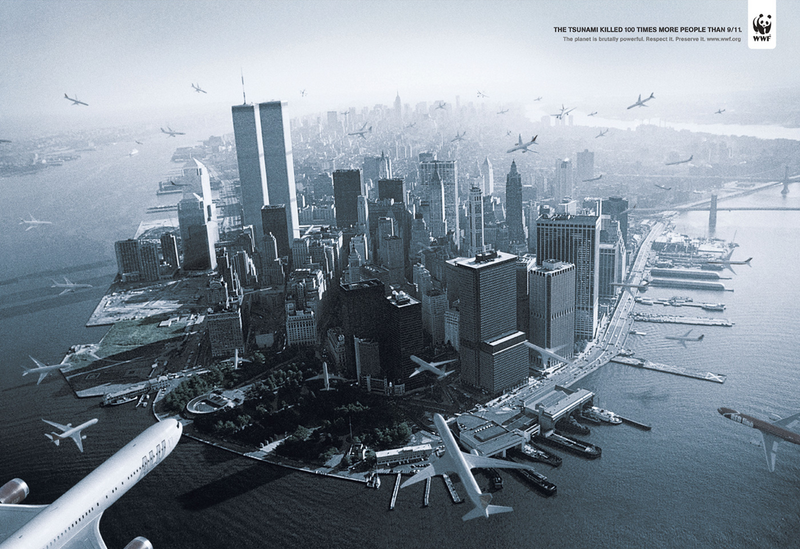 DDB was contracted by the World Wildlife Fund (WWF) to create an advertisement for the Brazilian market in late 2008, advertising/ addressing the dangers of Tsunamis. As you can imagine, it was pulled immediately for some very obvious reasons. An obscure ad that ran once in a small Sao Paulo newspaper months ago has come back to haunt DDB Brasil and its conservation client, the WWF in Brazil, in the latest example of the internet exposing a local ad to global condemnation. Running an ad once is often a tactic to make it awards-show eligible, and “Tsunami” somehow ended up among a bunch of the agency’s submissions to this year’s One Show in New York. Advertising Age reported that the WWF and DDB Brasil later went on to releasing a statement on their sites apologising for the ad, and attributing its creation and release to the inexperience of some professionals on both sides, and was not meant to disrespect the suffering of Americans. There is also a video form of the ad, but it wasn’t claimed to be made by either party (hmmmmmmmmmmmmm).